The other $500 is going to another non-profit. 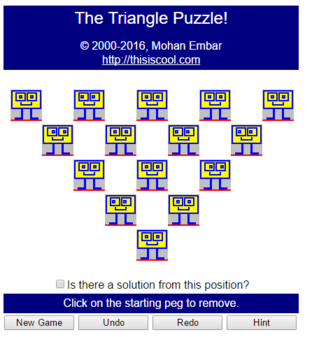 The Triangle Puzzle is a fun, challenging, animated puzzle game with hints! I've written two versions: one written in 2000 for Windows, Windows CE, and Palm OS, and another written in 2008 for Windows, Mac OS X, Linux (GTK+) and Microsoft Silverlight (with more versions forthcoming). Most of the 2008 versions have cool sounds and larger pegs. Rated Five Cows by Tucows (Palm OS version)! The Triangle Puzzle features fun, animated pegs and a hint mode! Versions are available for Windows, Mac OS X, Windows CE, PalmOS and Linux! To play, you remove a starting peg from any hole, then repeatedly choose an arbitrary peg and then jump either horizontally or diagonally over an occupied hole into an empty hole, removing the peg you jumped over. You repeat this process until there are no moves left. The object of the game is to end up with exactly one peg. Click here to contact us for a whitepaper, more details and licensing information. Applications can be written in such a way that they survive ports across languages and operating systems with a minimum of change (current supported languages: C++, C#, Java, Delphi; operating systems: Win32, Mac OS X, Linux, WinCE, Palm OS, and any OS with a decent Java implementation). Java isn't the only way to achieve cross-platform results, even with a non-trivial user interface. The native C++ executables for Win32, OS X, Linux, WinCE and Palm OS share the same, sizeable codebase with only a slight amount of operating-system-specific code. What's more, the resultant executables are small and fast (the 8K solution cache increases the size somewhat in the 2000 Palm OS version, and the sound files add bulk to the 2008 Win32 and OS X versions). I wrote the first incarnation of the Triangle Puzzle on a TRS-80 Model III when I was 14 years old. That summer, we had gone on a family vacation to Door County, Wisconsin and I found and bought the puzzle at a gift shop. I spent that entire vacation unsuccessfully trying to solve the puzzle myself. When I got home, I typed in the BASIC version (here's the listing!) and started it running. It was churning away when my mom called out "Mohan, the pancakes are ready!" and I had to tear myself away. When I came back upstairs, I saw SOLUTION FOUND: on my screen with a bunch of moves. My first reaction was: "Yeah right," and half-heartedly started making the moves. To my shock, the program had found a solution! Note: The images in this program may not be used without prior consent. 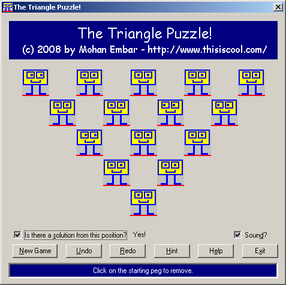 In addition to the Java version, The Triangle Puzzle has native executables that run on Windows, OS X, Linux, PalmOS and Windows CE. Download them from here. Download by first saving the file to a folder on your hard drive, then run the install program (Windows) or unzipping the file (Palm). OS X users can drag the application from the .dmg file or play it directly from there. The Triangle PuzzleTM Copyright © 2000-2008 by Mohan Embar All Rights Reserved. 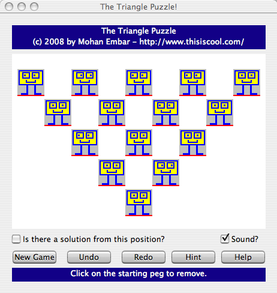 The Triangle PuzzleTM is written as a personal project by Mohan Embar. He has made this program available for download on this website under the following terms and conditions. Usage of this program indicates your acceptance of the following license conditions. If you do not agree with these terms, you may not use this program. You are exempt from this agreement if you do not have Internet access or if you have purchased this program from me for a fee.